Oak Waterbury No. 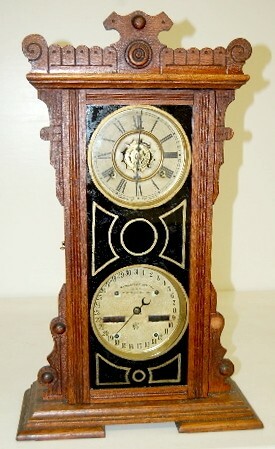 44 Double Dial Calendar Clock 8 day time and strike with alarm; 5" marked paper dial on tin; has pendulum; no key; painted door; not tested for running condition. (Dials crazed with some loss to dials; door looks to have been repainted.) 23 3/4"